So you've read my previous post and are ready to hunt for your new gear, it's your luck day! I'm going to walk you thru the fastest way to get some basic epic gear. How does a Gladiator's Scaled Helm with 1257 armor sound? 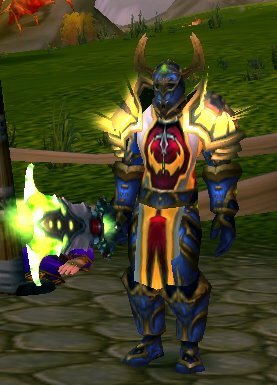 How about shoulders with 1160 armor? Great huh? Welcome to what some in the warcraft community deem "welfare epics". They're called welfare because as long as you spend the time playing you WILL get these items, there's zero chance for failure. But don't let the term fool you, it takes many hours to get these, but I'll show you how to minimize that time and get geared up ASAP! You should get an arena team together as soon as possible. The link above provides all the details, but in A nutshell, arena is fought in teams of 2,3 or 5 (you can be a member of all 3). These matches are called 2v2 3v3 and 5v5. Points are awarded once per week - on Tuesday and the number of points you get depend on your team rating. The more matches you loose, the fewer points, the more you win the more points you get. You'll receive (or loose) about 15 points per match and you need to fight 10 matches per week in order to receive points... Don't worry, the matches go quick and fighting 10 should take an hour or less. #1) First of all you'll need a team charter. This will cost 40g per person (although as the guy getting a team together you may need to front the majority of the cost if your teammate is poor)....If you're short gold, quest for it or sell stuff on AH. I'll talk about making $$ in a later article. #2) The easiest group to form is 2v2.. .just you and a buddy. Get someone from your guild, or someone you team with often. If you don't know anyone then post on the #1 channel in any city that you're looking for an arena partner. The most important thing is that you can agree on a common time each week to meet up for an hour. If you don't meet you won't get points. #3) Play your 10 matches..... Unless you're winning, only do 10. I'm going to tell you this now; you WILL loose, and you'll probably loose big at first. This is because your gear is not good enough, you haven't developed strategies with your partner, you may not even have a voice server (highly recommended by the way) to talk in battle with your teammate. So why play? Here's the great thing about Arena. Put in your 10 games and no matter how bad you are you will get epic armor and weapons with enough points. Even if you loose all the matches for the first month you're still (basically) guaranteed at least 200 points per week for playing.... Most of you will probably be around 225 points. 1 piece of armor goes for about 1800 points, so that's 9 weeks of play. That may sound like a long time, but remember it's about an hour per week so that's 9 hours of play.... and that's probably a worst case scenario I expect most people to average 6-7 weeks aka 6-7 hours for the gear. Sure, it takes a while but it's GUARANTEED. Play your matches you will get the armor and guys let me tell you Arena Season 3 armor; known as Vengeful Gladator armor is the best out there for Ret Pally's. Go ahead and check out the link above, just wipe your drool. An hour per week is very minimal.. but it's important you start NOW... Each week you delay is an extra week you'll have to wait! Don't want to wait 2 months for Epics? Not to worry, welcome to Season 1 Armor available from the battlegrounds... that article tomorrow!